In this latest showdown between the Olympus Pen F vs OMD EM5 II I’ll take a look at these two popular Micro 4/3 cameras and compare features, handling and image quality to see which one you should buy. So let’s take a quick look at the features of each camera before we delve a little deeper to put them up against each other in real World use. 5 Axis Image Stabilisation built in to the body. 2.36 million dot OLED Viewfinder. The viewfinder on the Pen F is the same as that found in the Olympus OM-D E-M10 II offering 1.23x magnification. 10 FPS mechanical shutter and up to 20FPS with the electronic shutter. Fully articulating 1.04 million dot 3″ touch screen LCD screen. 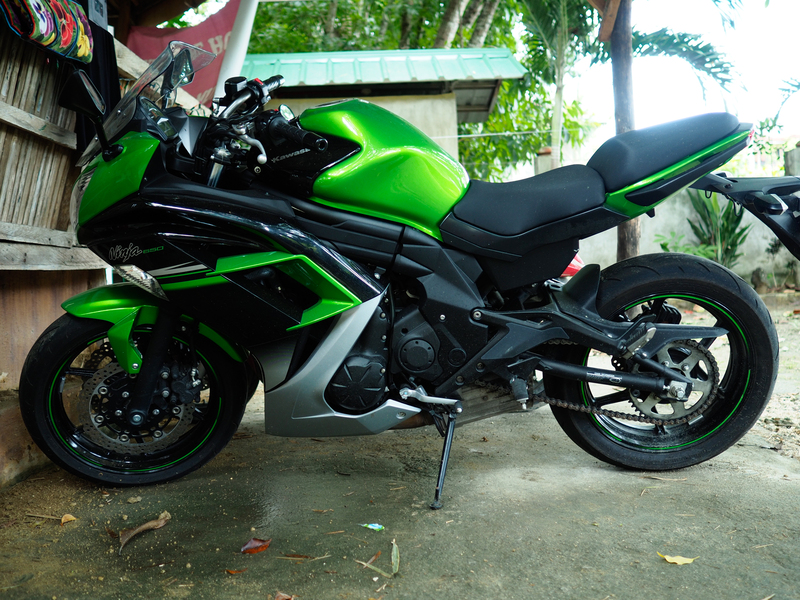 50mp High res shot mode. 1/8000 mechanical shutter speed , 1/16000 with the electronic shutter. Colour Wheel control dial giving access to fine tuning of black and white, colour and ART profiles. 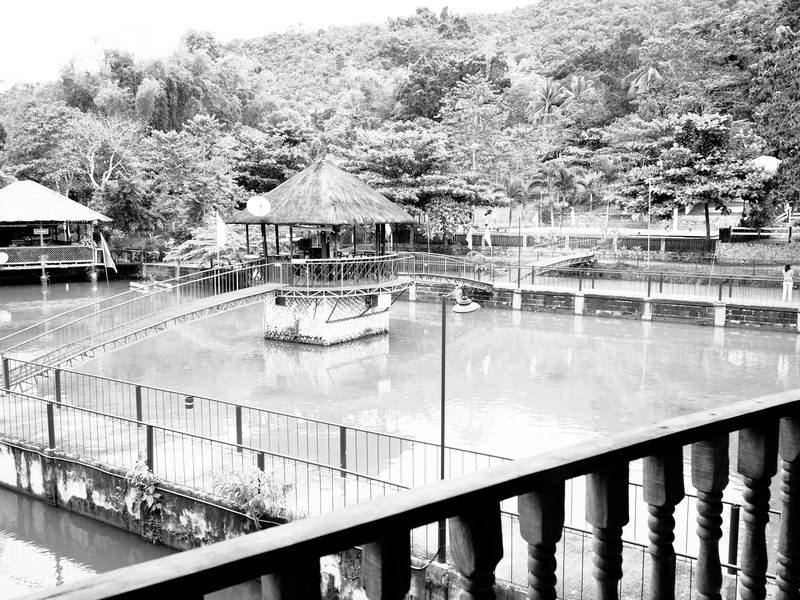 1/8000 mechanical shutter speed, 1/16000 with electronic shutter. As you can see when comparing the Olympus Pen F vs OMD EM5 II these two cameras are more similar than their looks may suggest. The major differences are the new 20mp sensor found in the Pen F, the range finder style of the Pen F placing the viewfinder on the left of the camera rather than having the centrally located viewfinder hump of the OMD EM5 II and the weather sealing offered with the EM5 II which is lacking on the Pen F.
Both cameras feature a 2.36 million dot OLED viewfinder but the OMD EM5 II offers more magnification which results in a larger and more detailed image. In practical use the differences are not huge and are only really noticeable when switching straight from one camera to the next. Both offer a clear and crisp view of your subject and both work well in low light. 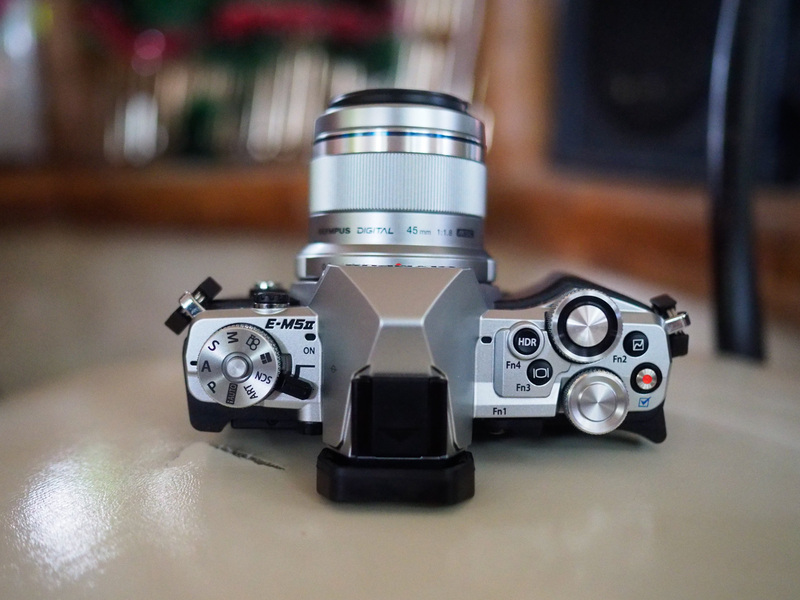 Manually focusing is slightly easier on the EM5 II thanks to the larger view offered. The Pen F does not feature weather sealing unlike the OMD EM5 II. If you plan to use your camera in adverse weather conditions such as rain, snow or in dusty environments then the weather sealing of the OMD EM5 II is a real advantage. Assuming of course that you have matching weather sealed lenses such as the Olympus 12-40mm f/2.8 Pro. The Pen F is more suited to use with small and light primes which themselves are not weather sealed so it makes sense for the Pen F to also lack weather sealing. Still a big plus for the EM5 II here. Handling of the two cameras is a very important factor when trying to decide between them. The EM5 II offers a more standard mini DSLR feel with a viewfinder hump in the middle and a small hand grip on the front. It feels well-balanced with even the larger pro zoom lenses in the Olympus range. 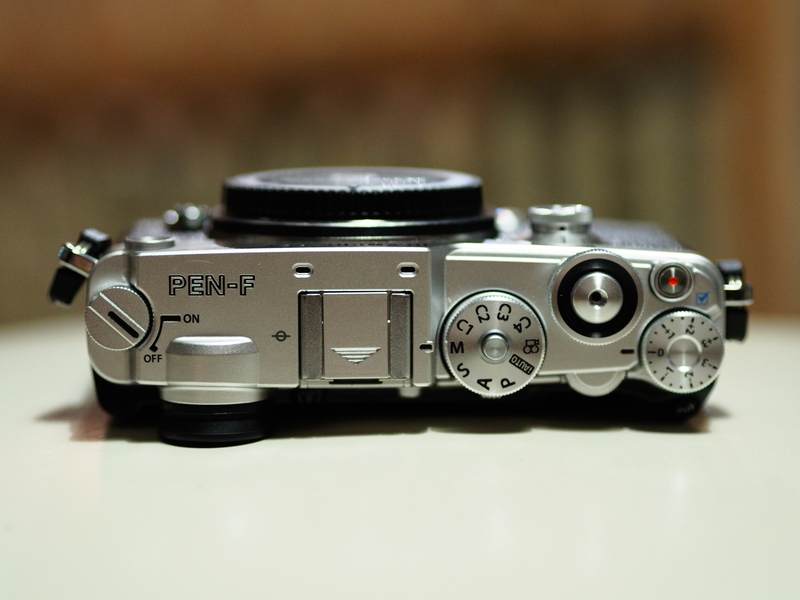 On the other hand the Pen F is a range finder styled camera with its viewfinder placed on the left hand side. This will suit right eye dominant shooters. There is no grip on the front of the camera but the thumb rest on the rear does give enough purchase to comfortably hand hold the camera with one hand when using primes. The Pen F features a more simple external layout with less function buttons on the top plate. This makes the Pen F feel less cramped in use. It also features a physical exposure compensation dial which is well damped. In reality I’m not sure how much a physical exposure compensation dial really adds to a camera where you are still changing shutter speed and aperture in the standard way with the front and rear control dials. The uncluttered layout on the Pen F is very user-friendly. The finish on both cameras is excellent with them both sporting good build quality, well damped dials and magnesium alloy bodies. Both have a high quality leatherette wrap which adds to grip. The buttons on the OMD EM5 II feel slightly more rubberised when pressing them due to the weather sealing but both give good feedback in use. Both cameras feature 1.04 million dot 3″ touch screen LCD’s but the Pen F’s is easier to use as I sometimes found that when opening the EM5 II’s screen it would pop the electronic viewfinder eyepiece off. This was a rather common and irritating occurrence leading me to spend 20 minutes trying to find where the eyepiece was on one occasion. Here is the offending viewfinder eyepiece which came off accidentally when I was moving the EM5 II to take some photos. So I thought I’d take a picture of it. The Pen F’s LCD screen is also easier to open as the back is less cluttered and easier to position your fingers to get decent grip. I can open the Pen F LCD quickly using my thumb at the bottom to flick it out. If I use the same technique on the EM5 II it causes the LCD to push up slightly which then pops the viewfinder eyepiece off. The LCD on the Pen F is easier to flip out quickly. 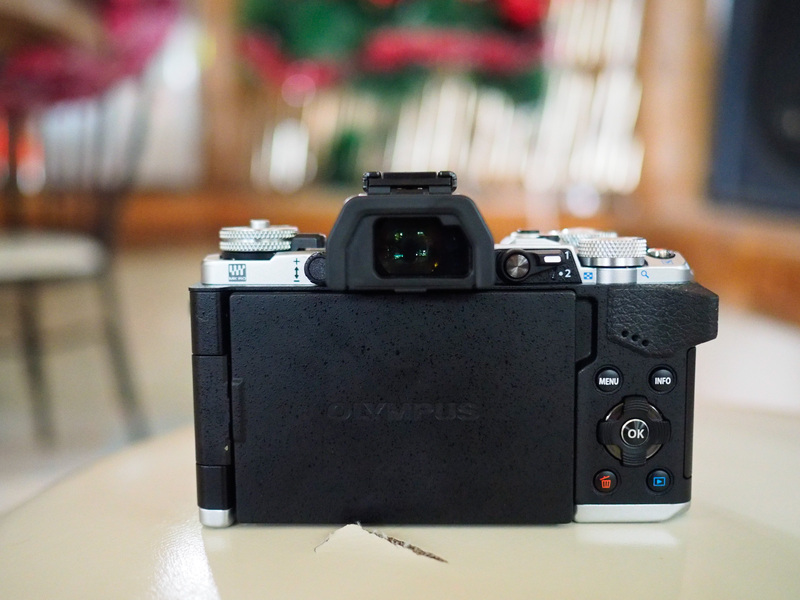 One feature of the Olympus Pen F is the ability to use the LCD screen as an auto focus track pad when shooting through the viewfinder. Simply slide your thumb around the screen to change the position of the auto focus point. In practise it works well and is a very quick way to change your AF point. You can see this in action in my video below. It is important to ote that when actually doing this in practise the viewfinder shows the auto focus points spread too. 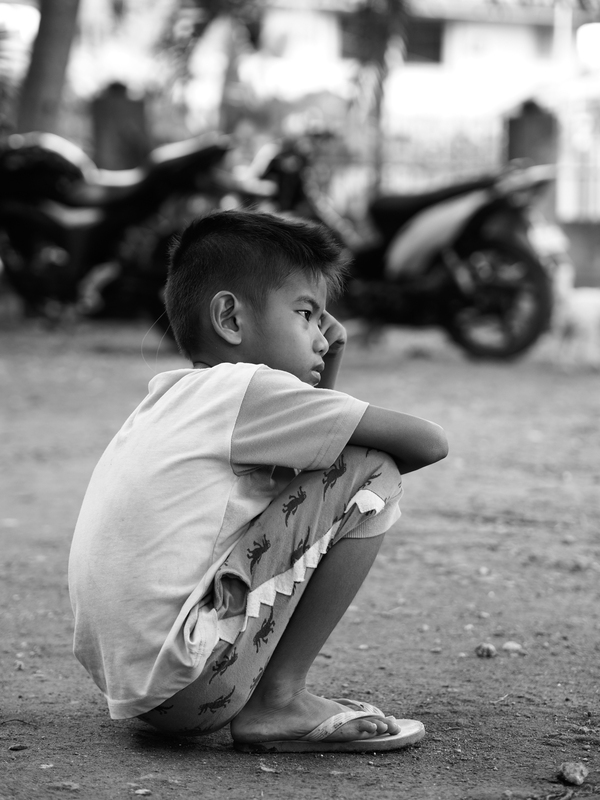 I also noticed that there was less lag when switching between the LCD and electronic viewfinder with the Pen F. On occasion the OMD EM5 II would fail to pick up that I had switched resulting in staring at a black viewfinder. With the addition of the new colour wheel the Pen F allows you direct access to the new black and white mode as well as a new colour mode alongside the Art modes. If you shoot Jpeg and like black and white then having direct access to these as well as a dedicated switch on the rear of the camera to cycle through the options not only saves time but involves less diving in to menus. 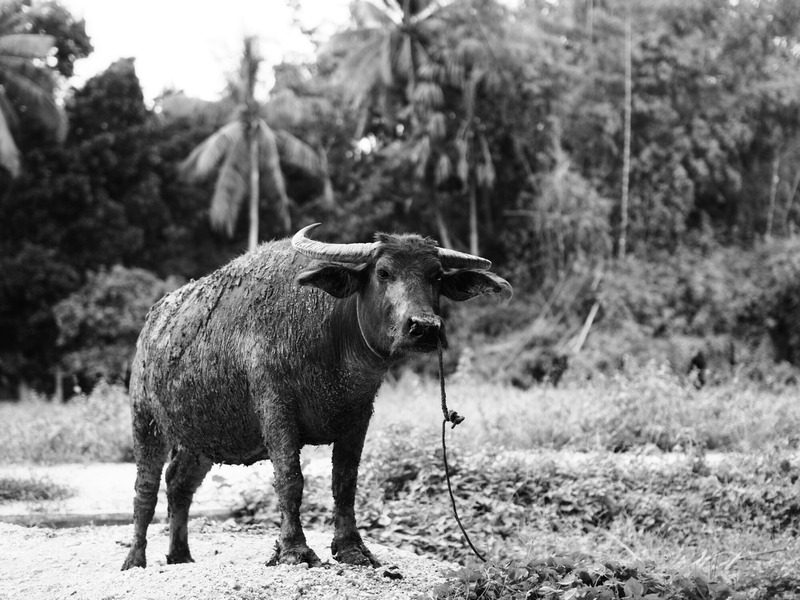 I’ll talk more on the actual black and white output in the image quality comparison below. Both cameras feature Olympus’ excellent 5 axis IS but I found it to be slightly more effective on the EM5 II probably due to the lower resolution sensor. I could handhold the Pen F down to 1/2 second but could stretch that to 1 second with the EM5 II. 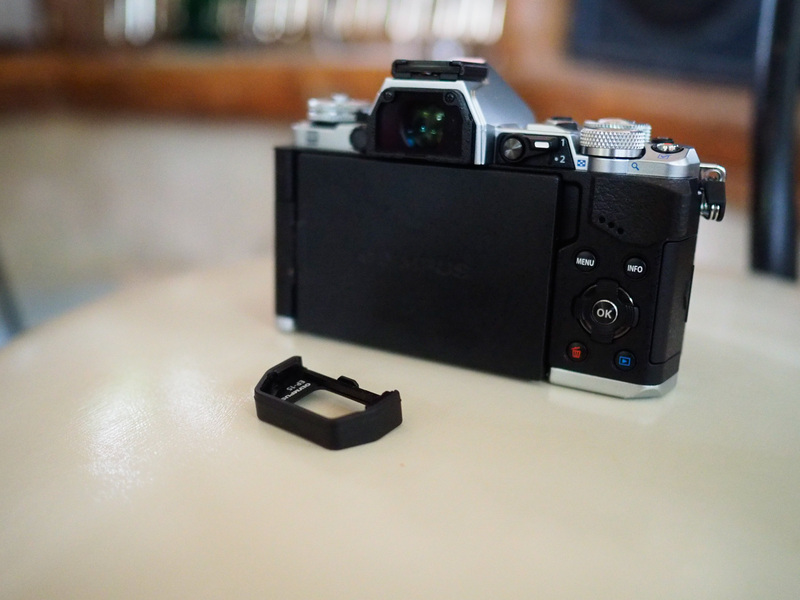 The EM5 II also features a separate memory card slot whereas the Pen F memory card fits in to the battery compartment and removing the memory card can sometimes be a bit fiddly as there is not much room to grip the memory card when extracting it. 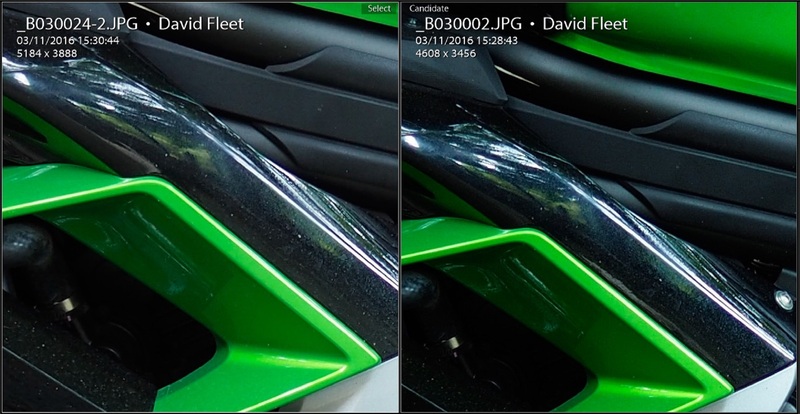 So here the Pen F’s new 20mp sensor goes up against the 16mp sensor of the OMD EM5 II. I have shot both of these cameras in loads of different situations from brightly lit portraits to landscapes and night shots to get a real feel for how they both perform. The Pen F offers an image size of 5184 x 3888 compared with the EM5 II’s 4608 x 3456 pixels. 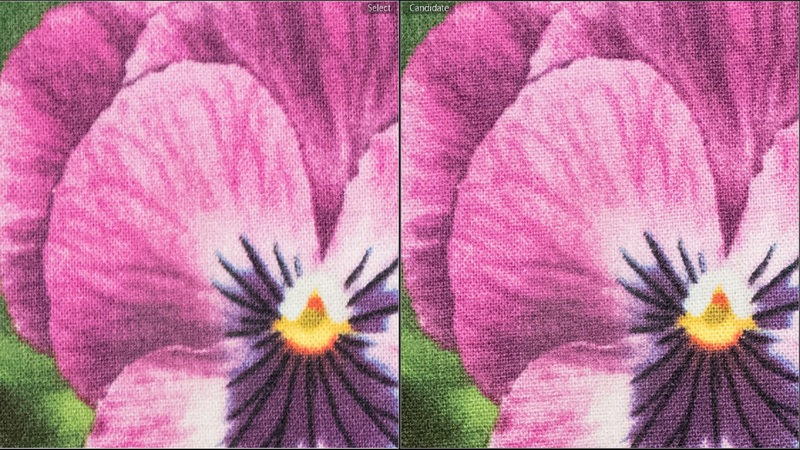 If you pixel peep you can see a very small increase in the resolution and detail of the Pen F images when compared to the EM5 II. The differences are small though and you wont even notice them in every shot you take. For me this difference was most noticeable in portrait shots when looking at eyelashes and eyebrows with the Pen F image just giving a little more detail. 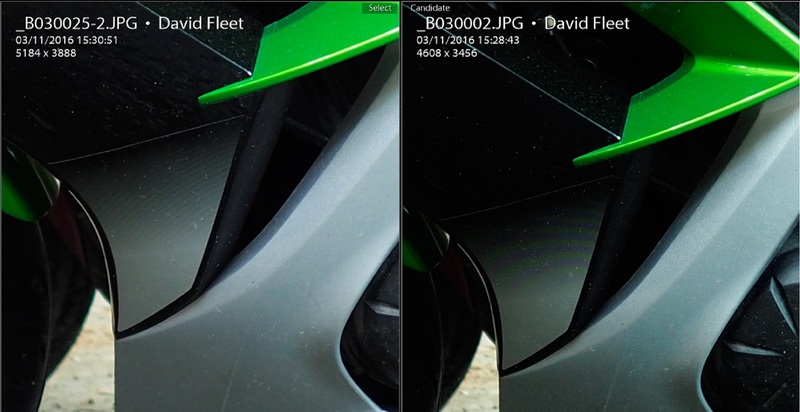 The Pen F image also shows slightly improved dynamic range with the EM5 II blowing out highlights more than the Pen F and showing less detail in shadows. 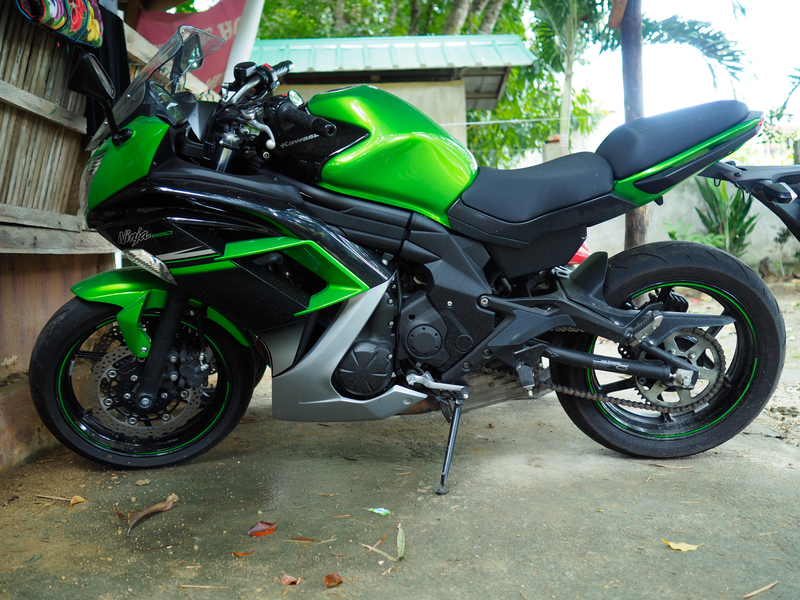 The differences are not huge but they are there. 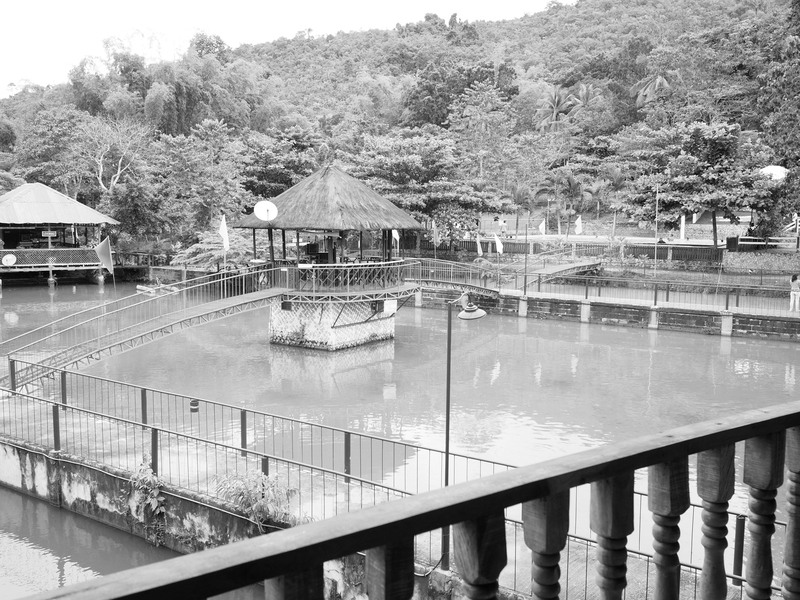 The two images below were shot at exactly the same settings on both cameras. OMD EM5 II image shot at ISO 200. 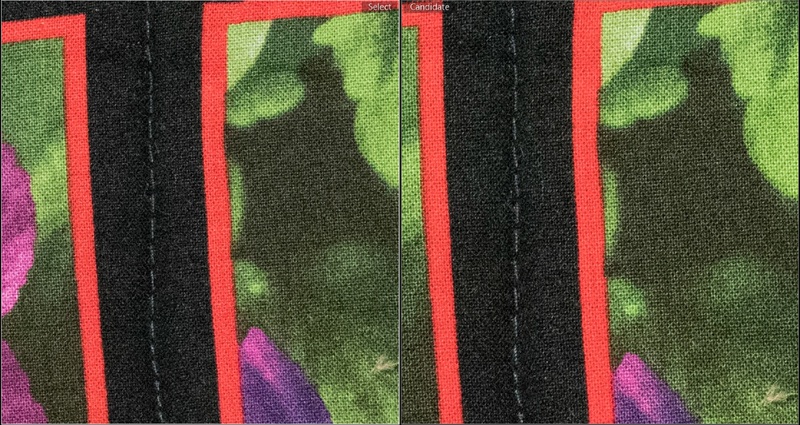 Notice the Moire on the OMD EM5 II image (right). Although the image quality improvements of the Pen F are not huge the slight improvements in almost every area are welcome. Noise performance between the two sensors is very close with again just a slight advantage going to the Pen F.
At base ISO I found that often the EM5 II image had some noise whereas I never saw this with the Pen F. I remember the base noise found on my original OMD EM5 put me off using it for professional landscape work. I’m glad to see the Pen F seems to have resolved this issue. 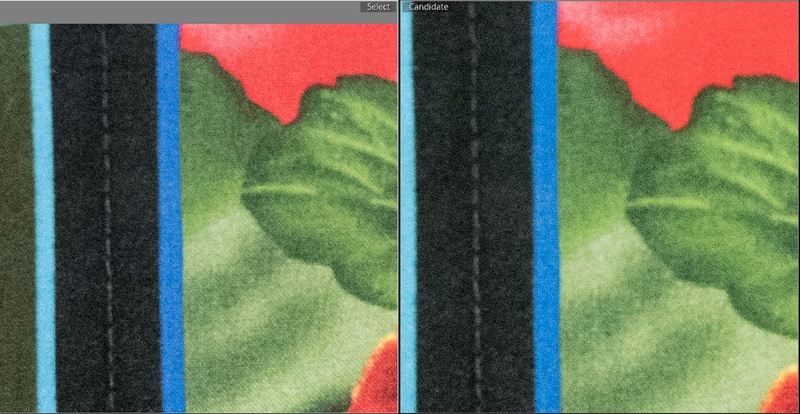 Once the ISO is pushed to 3200 and above the noise performance of both cameras was very similar with the Pen F just retaining a little more detail in the raw files thanks to it’s higher resolution. It looks like Olympus kept the same noise performance while increasing resolution so while this is not mind-blowing it is a decent enough upgrade. One of the main new features of the Pen F is the colour wheel found on the front of the camera. As mentioned before it allows you direct access to among other options the black and white modes. 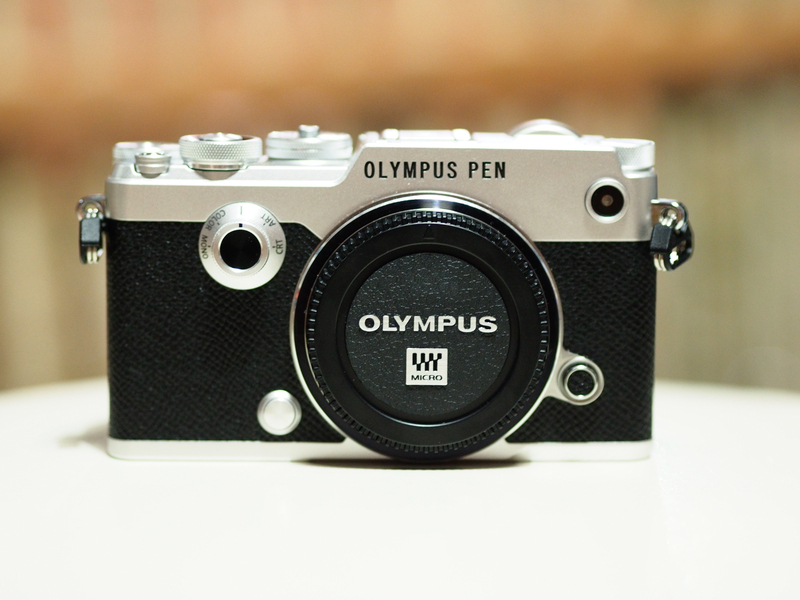 The Pen F has 3 black and white profiles compared with the EM5 II’s 1. Profile 1 is a flat monochrome, 2 is the Tri X high contrast look and 3 is an infra-red esque mode. Profile 2 is by far and away the nicest to use. When selecting black and white on the colour wheel you then choose your preferred profile in the Olympus Super Control Panel and whether to add grain or not (available in 3 strengths). You then access the colour wheel controls via a dial on the back. This then gives access to colour filters which unlike the OMD EM5 II are available in 3 varying strengths. Next up you can add a vignette to brighten or darken the corners and finally you have access to the images tone curve. You can also access the tone curve on the EM5 II but with the Pen F you can adjust the mid-tones too. In terms of in camera customisation the Pen F wins here with more options and quicker access. Monochrome profile 2 can produce really pleasing black and white images and no matter what I did with the EM5 II I could not replicate the results of the Pen F’ built in profile. Adding grain is really simple and adjustable in 3 stages, low, medium and high. 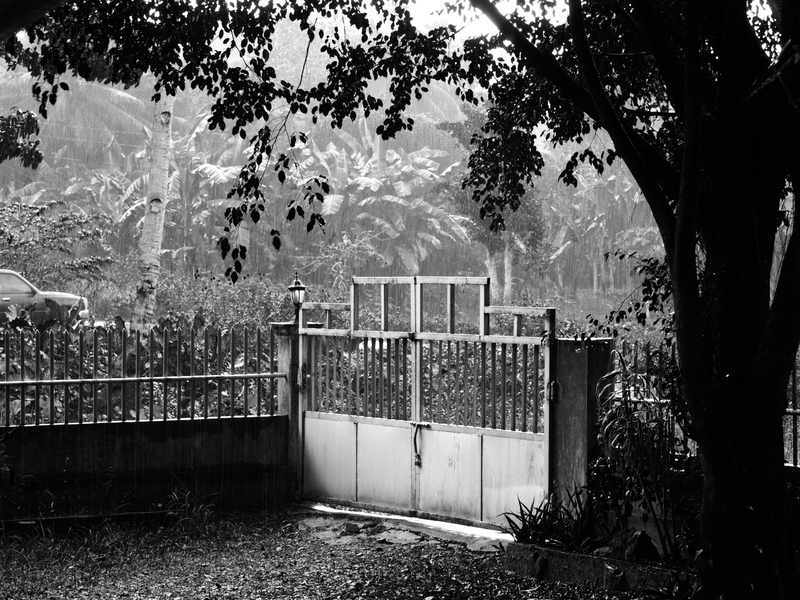 Below are examples of the grain produced by the Olympus Pen F.
Pen F black and white mode 2 no grain. If you want the best image quality between these two cameras then the Pen F wins but in my opinion the differences in image quality are not enough to be the decisive factor when deciding between these two cameras. So which camera is the best? In its favour the OMD EM5 II is weather sealed, has a bigger viewfinder, separate memory card slot, front hand grip and a 3.5mm external mic jack and it feels better when combined with larger lenses. It is also cheaper than the Pen F by a couple of hundred Pounds. In favour of the Pen F are 20mp sensor, improved image quality, faster performance, additional Jpeg customisation, LCD track pad functionality. There is no doubt that the OMD EM5 II is the better value camera, offering almost everything that the Pen F does in terms of features and image quality while being weather sealed, offering a better viewfinder and at a cheaper price. If you plan to use your camera in wet, cold, dusty conditions and team it up with a weather sealed lens then the choice is clear. Get the EM5 II. If you manually focus then you may also appreciate the larger viewfinder. However the Pen F is the more fun camera to shoot with. 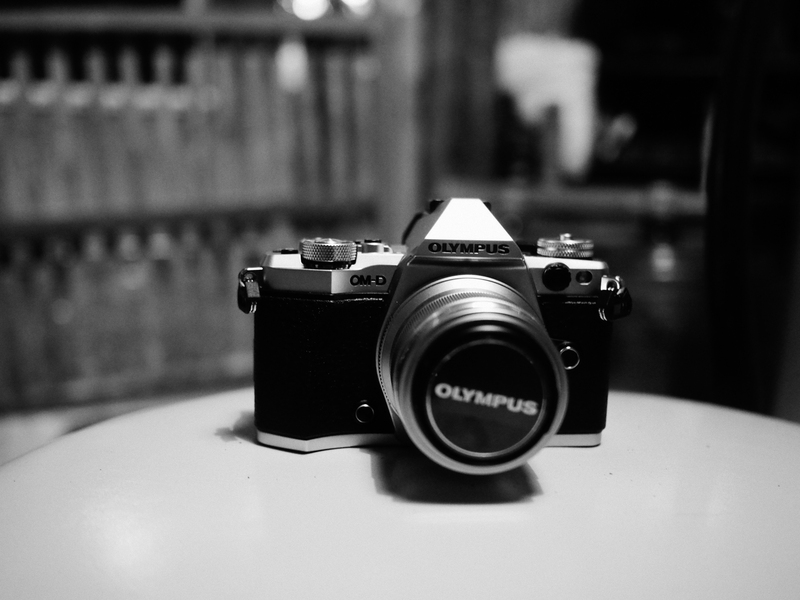 The camera feels and looks great with small prime lenses, making a great fun and discreet street photography tool. 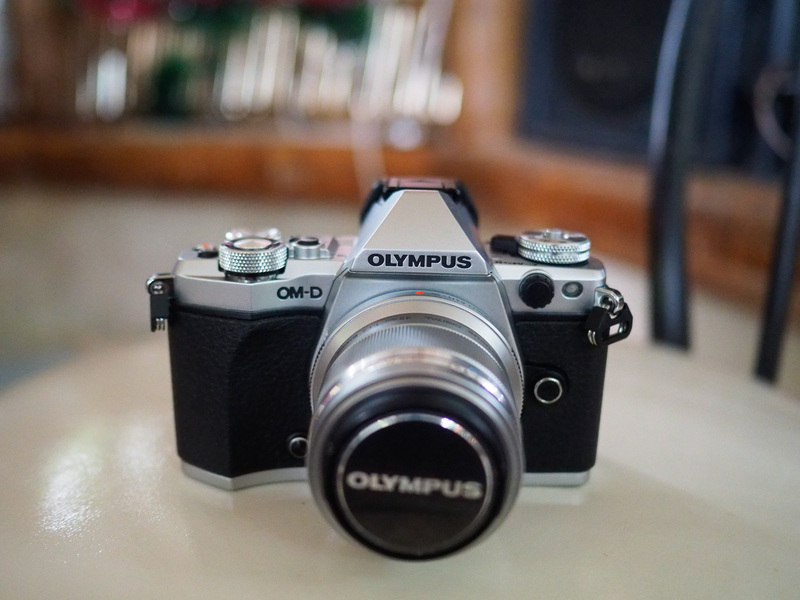 The image quality is slightly improved over the EM5 II so if you want the best image quality that Olympus currently offers then the Pen F is the winner. The new black and white modes and colour wheel are very intuitive to use and they offer great control over Jpeg output. Even as someone who used to shoot raw I found this mode highly addictive and the results are very pleasing. If you like the rangefinder style and are right eye dominant then the track pad auto focus selection is excellent. Shoot primes, don’t need weather sealing and want the best IQ of the two then buy the Pen F.
Both are great cameras and fun to use but the Pen F is a camera that feels like it has a soul and I really enjoy using it. The EM5 II feels like a tool and a very good one but it feels much more clinical than the Pen F. If I am taking just one camera out with me then the Pen F comes along and the EM5 II stays in my bag. That sums it up really. The Pen F inspires me to shoot when the EM5 II doesn’t. You can see more image examples and information in my Olympus Pen F Review or maybe you are considering the Pen F vs Fuji X100T if so check out that comparison. Make sure to comment below and let me know which camera you prefer and why. Which one did you end up buying and did you make the right choice? 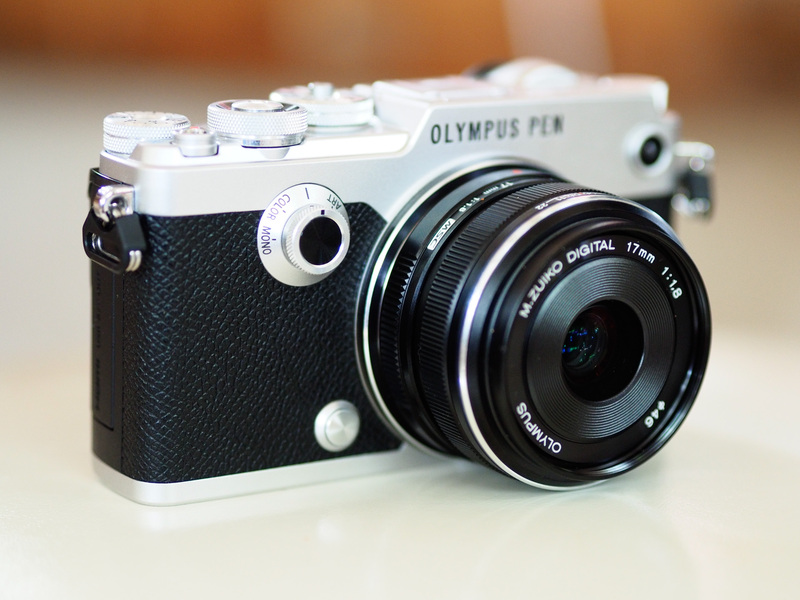 The Pen F and OM-D E-M5 II are both available from my Amazon links below. If you appreciate the time that I have put in (and it has been a lot of time today. Uploading the video alone took 7 hours thanks to a slow internet connection) to creating this article and video for you then please shop using my links. You can buy through them at absolutely no additional cost to you and no matter what you purchase I receive a small commission from the retailer. That commission helps me to keep this site going and to keep bringing you real world reviews and comparisons. It is the only way I make any money for all the time and effort that I put in to this website so thank you to each and every one of you who shops through the links below. I really enjoyed your review. I’m looking to purchase one of these two cameras shortly – I already have the original E-M5 and a Panasonic G85 and logically I wanted the EM-5 II because I love how great the viewfinder is on the G85 compared to the lower resolution and smaller one of the E-M5. However, I think I’m going to go for the Pen F because as you say, it looks like it is inspiring to shoot. I already have a larger viewfinder m43 camera and I’d like something to take out for casual shooting where it doesn’t just stay slung over my shoulder the entire time. Plus, it’ll look nice next to my ’66 Pen F on the display shelf at home when I’m not using it! Thanks for commenting. I don’t think you will be disappointed with the Pen F. Did you get one in the end? Thanks for commenting. Appreciate it.